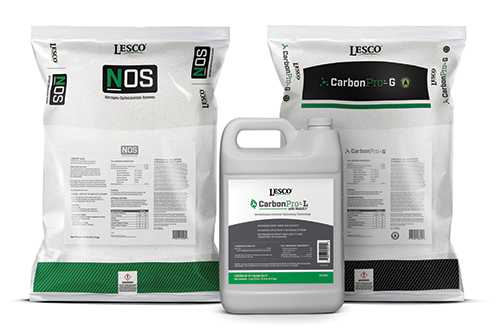 SiteOne Landscape Supply introduces LESCO NOS, LESCO CarbonPRO-L and LESCO CarbonPro-G.
All three new turf maintenance products utilize the latest agronomic technology to maximize turf performance for landscape contractors and their crews. The new products offer enhanced efficiency fertilization programs and innovative supplementary products that improve the soil and optimize future fertilizer applications. LESCO NOS, or Nitrogen Optimization System, is a fully incorporated DCD- stabilized nitrogen fertilizer that prevents nitrogen loss. The technology in LESCO NOS slows the rate at which nitrogen is lost to environmental leaching and volatilization. By keeping nitrogen in an ammonium form longer, the plant efficiently uses nitrogen when needed. CarbonPro-L with MobilEX is a nutrient-optimizing system that harnesses the power of plant-microbe interactions and organic soil sciences to maximize plant health and performance. The proprietary MobilEX mobility technology supports cell wall stability by mobilizing calcium ions from organelle storage and increases nutrient transport by binding minerals to facilitate movement throughout the plant’s vascular tissues. The multisolution product can be tank mixed with most nonpesticide liquid applications. Now in granular form, CarbonPro-G is a microbial and carbon-based plant health nutrient optimizer that can be applied with a standard broadcast spreader to turf and landscape plantings. The multisolution product uses soil conditioning to deepen and strengthen roots, help with turf recovery, increase nutrient uptake and efficiency, assist with seed establishment and reduce operation costs spent treating turf stress. Its biocharged carbon structure holds water, making it available when needed by the plant. When applied, CarbonPro-G regulates soil pH balance to be more neutral and is an ideal option to repair damaged turf from winter salt damage.